This entry was posted in crime, gun control, Gun Control/2nd Amendment, Liberals/Democrats/Left, Taxes, United States and tagged #2A, Baltimore, Baltimore Mayor Catherine Pugh, gun buyback programs. Bookmark the permalink. I remember in Washington when they did a “buy back” in Olympia that turned into a huge gun show. People were offering more than the cops and thousands of guns were exchanged. Guns that went unused in closets were sold to enthusiasts that actually used them. It was great. They won’t allow that anymore. Of course now they have that registration crap on the books. 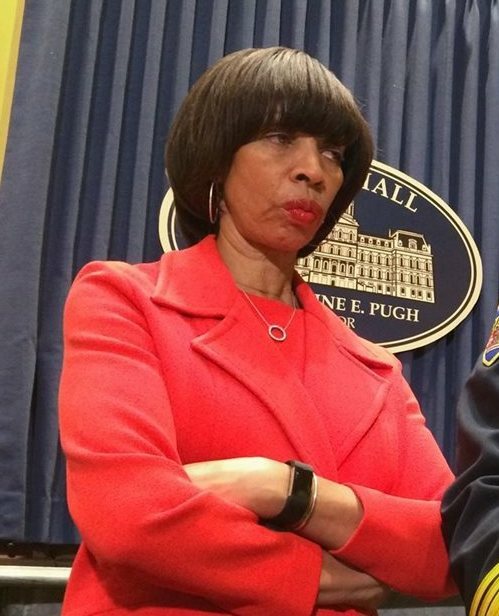 She’ll need the upgrade, given Baltimore’s high crime and homicide rates. Maybe I should start attending these events. Maybe I could pick up another ASSAULT WEAPON before it’s turned into scrap!!! She would do much better dealing with a reputable pawn shop. Of course the message to these idiots actually dumb enough to refer to these scams as “buy back” is appropriate. Smart girl! I remember seeing on Christian TV channels in prior years that Orlando black pastors & churches were pulling the same stunt, trade in your guns for a pair of new Nike’s & other gimmicks. Central FLA East Coast PDs also held gun grabs in those years (early to mid 2000’s), & they usually held them in the “black” parts of towns. Hopefully, most whities keep their guns than fall for the Dem anti-gun “Do Gooder” propaganda. From her picture she looks like she’d be more at home in a white gown in New Orleans. That’s what I call a smart woman with hairs on her chest? Mayor Pugh is a complete idiot.